Our three kids very seldom agree which TV program or movie to watch. Allowing for less discussion when screen time is granted, I’ve set up a mobile entertainment center where each kid may watch the movie of their choice – this may be used during long drives, on trains or buses, and everywhere else where there’s low or no voltage and a need to grant the kids some screen time. The setup is simple, using a Raspberry Pi B+ running Raspbian and a Mikrotik mAP2n. The RPi is directly connected to the mAP2n with an Ethernet cable. 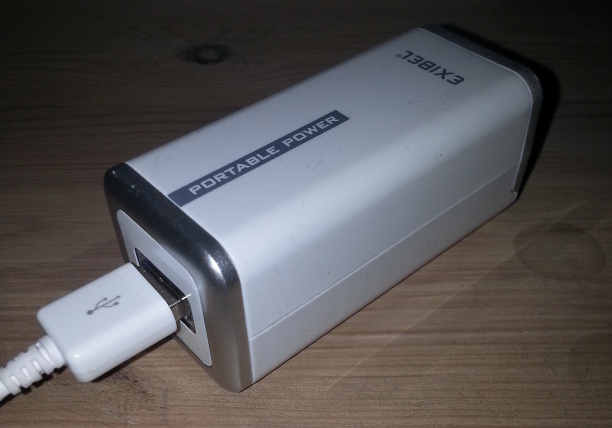 Both are/can be powered by microUSB voltage and cable. The RPi is also equipped with a USB WiFi adapter, configured as a WiFi client, so when the unit is within range of the wireless network at home I can update it and transfer media files to it. The two units tied together with velcro. When finalizing the project I will need to find a better case. After having slimmed down the RPi by removing any package not needed, I installed minidlna. While the minidlna project was recently renamed to ReadyMedia, in Debian/Raspbian it still goes by its former name. To administer the mAP2n from the RPi I also installed mactelnet, and to make sure both units logged with useful timestamps I added an ntp server. Finally, it seems the mAP2n does not support running a DHCP server, so I left that to the RPi (isc-dhcp-server). The DHCP server listens only on eth0, to which the mAP2n is connected. On each kid’s tablet, I installed a DLNA controller (I chose the Ginkgo DLNA player, but I assume any kind of DLNA/UPnP controller will do). Note that the Ginkgo DLNA player is simply streaming from the media center to the device, but not rendering the content – you will need something else for that. I’m very fond of VLC for Android and it works excellent in this use case. Configuring the mAP2n as an AP/bridge, a separate SSID was configured. 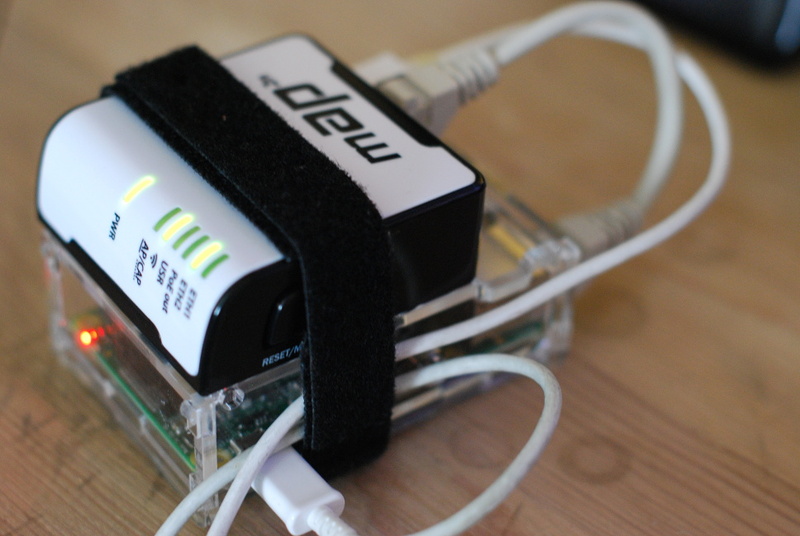 The mAP2n synchronizes its clock to the RPi. The interfaces wlan1 and ether2 are bridged, and the bridge holds the unit’s IP address. 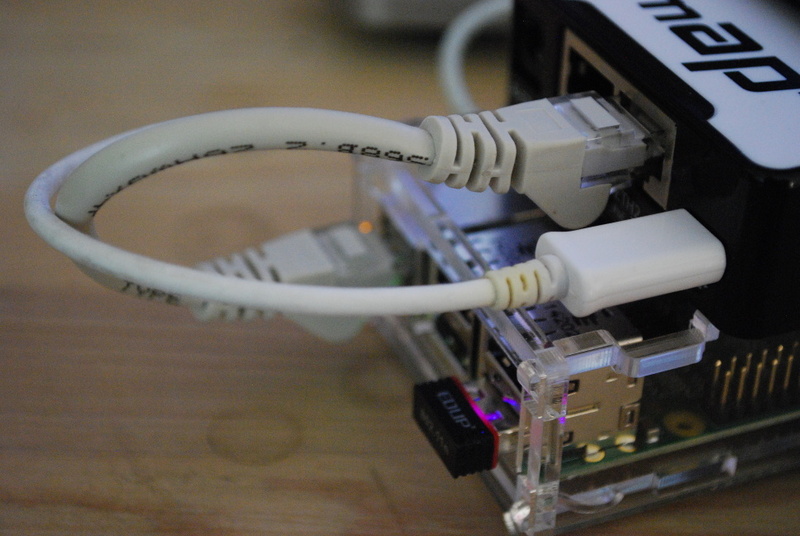 Install Raspbian on a Raspberry Pi. Configure wlan0, supplying SSID and credentials, for being a WiFi client. Make sure you can SSH to the RPi over the wlan0 interface. When successful, configure static IP on eth0. Connect ether2 on mAP2n to eth0 on the RPi. Configure the mAP2n as an AP/bridge. Set up SSID and credentials for the AP. Set up the tablets for DNLA streaming. Note the USB WiFi adapter, providing wireless update of the RPi unit when within range of the home network. Throughput with three concurrent players showing .mkv movies (720×576 px, 25fps, H264 MPEG-4 AVC, MPEG AAC) sometimes peaks at around 22 Mb/s, and the RPi doesn’t break a sweat when serving at that speed. Obviously different formats would affect the RPi load and WiFi throughput. Attaching a 4 x AA portable battery pack as shown below, the two units (mAP2n USB powered from the RPi) were running for more than three and a half hour, and during this period they streamed movies to one tablet for two and a half hour. Exibel battery pack bought from Clas Ohlson.